Come to the garden Saturday, May 17 for a fun day of making music! Wind chimes can be made with an exciting mixture of elements. We’ll have fasteners, adhesives, and basic materials, like filament, string, drills, glues, and bamboo. 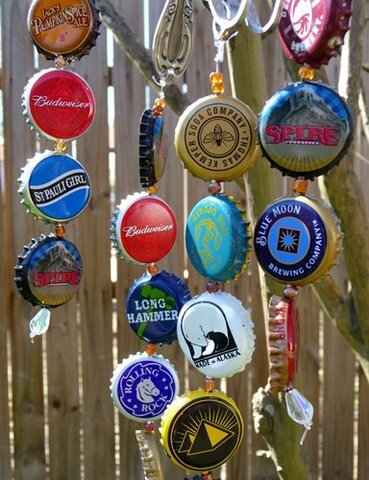 But to make your wind chime uniquely yours, bring items like old keys, bottle caps, earrings, beads, flatware, (smooth) sea glass, and industrial hardware. Just use your imagination! You’ll have time to make one for yourself and possibly one for the garden. Search the web for inspiration for your music maker! Join instructor Susan Dannenfelser, local sculptor and garden member, at the Lafayette Community Garden from 2:00PM to 5:00PM to discover your inner artist. For more inspiration, visit Susan Dannenfelser at www.dannenbeck.com. Kids 10 and under, please bring your own adult. This entry was posted in Uncategorized and tagged art, chime, class, craft, garden, Kids, Lafayette Community Garden, music, reuse, sustainable, upcycle, wind.